United Nations: Rahaf Mohammed al-Qunun's desperate and ultimately successful bid for asylum in the face of alleged death-threats from her own family, provides a glimpse into the precarious situation of millions of refugees worldwide has said the UN High Commissioner for Refugees. 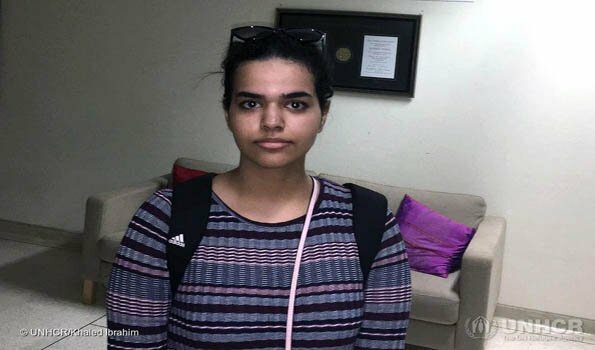 In a statement on Friday, the UN Refugee Agency, UNHCR, said Canada had agreed to give asylum to the 18-year-old Saudi national who fled her family in Kuwait before her passport was taken away at the Bangkok airport on Sunday. The agency welcomed the decision of the Canadian Government to provide international protection and a new home for the Saudi national there as a resettled refugee.UNCHR chief Filippo Grandi said in his statement that ?refugee protection today is often under threat and cannot always be assured, but in this instance international refugee law and overriding values of humanity have prevailed.? UNHCR consistently advocates for the principle of non-refoulment, which states that anyone confirmed, or claiming to be in need of international protection, cannot be returned to a territory where their life or freedom are threatened. This principle is recognized as customary international law and is also enshrined in Thailand's treaty obligations, according to UNHCR, although it is not a party to the 1951 UN Refugee Convention or its 1967 Protocol, defining the status of refugees. With political sentiment and public attitudes towards refugees having hardened in some countries in recent years, formal resettlement - the mechanism by which Ms al-Qunun has been accepted by Canada - is available only to a fraction of the world's 25.4 million refugees, typically those at greatest risk, many of whom are women.